What more can be said about Sgt Pepper’s Lonely Hearts Club Band? This particular album has been near or at the top of every single ‘Best of’ album list for the past 5o years. But what is it about this album that gives it this legendary status and staying power? To understand what makes Sgt. Pepper’s Lonely Hearts Club Band special, you’ll have to understand how it was made. In the middle of 1966, McCartney, Lennon, Star, and Harrison were fed up with being The Beatles. Not being in a band or playing music, but the product Beatlemania had become. Between not being able to hear themselves during their continuous tours and the cultural shift in music, they were exhausted. More importantly, they were being hindered as artists. Despite the back-to-back release of their creatively progressive albums Rubber Soul and Revolver, it was becoming more difficult to grow in a live setting with their meager set-up. As discussed in my review of The Beatles: Live At The Hollywood Bowl, technology was no match for the thousands of fans. Audio technology aside, The Beatles’ craft had progressed beyond what drums, bass, and 2 guitars were capable of. In fact, the tour in support of Revolver featured no songs from the album itself! Touring went from being a chore to a downright nightmare. It was just as stressful on the band’s management. So much so, Harrison gave their manager Brian Epstein an ultimatum: If The Beatles’ contract made touring a requirement, he’d quit. It wasn’t just The Beatles who were changing, it was the entire world. It was at a turning point. No longer a fad for adolescents, rock n’ roll had become the voice of the generation. The teenagers who were once infatuated with greasy haired pop stars were now becoming adults and the culture reflected that. Instead of getting friends together for a Coke at a sock hop, audiences reached for a society founded upon peace and love. The hippie movement was on the rise and psychedelia had found its way on mainstream radio. It was no surprise the proverbial ‘Four’ were completely over being ‘fab’. Months leading up to the release of Sgt. Pepper’s Lonely Hearts Club Band at the end of May 1967, fans and media publications alike, thought the honeymoon was over. Were they finished? Had Beatlemania faded? Those assumptions couldn’t be any further from the truth. Sgt. 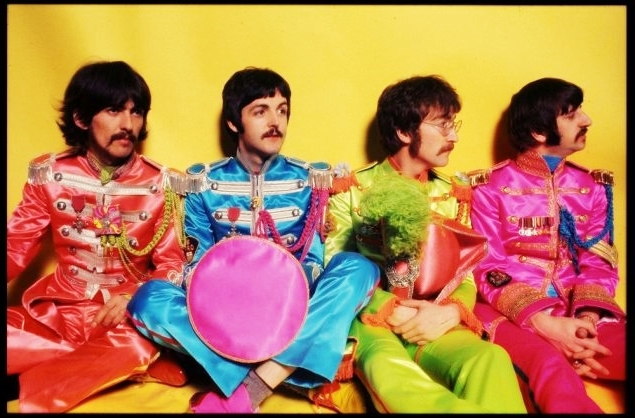 Pepper’s Lonely Hearts Club Band saw The Beatles reaching the next level of their artistry. Everything about Sgt. Pepper screamed creativity. The opening title track plays much like an overture. After 50 years, we all know and can sing along with the inane, fourth-wall-breaking lyrics but there’s a lot more going on behind the scenes. For the verses, the song utilizes the Lydian scale giving it a bright, upbeat feeling. But when the chorus kicks in, the blues-based pentatonic scale in the vocals and guitar, add so much punch it’s impossible not to at least tap your feet. Music theory tricks are used throughout the entire album. On the dreamy “Lucy In The Sky With Diamonds”, the intro keyboard riff is built around an ascending bass line with the left hand, while the right repeats a 3 note riff. The same riff is played throughout the verses only elevated by the bass guitar not playing root notes and Lennon’s monotonous vocal line. The surreal mysticism comes crashing down with a 1-4-5 chord progression in the chorus. The creative progression wasn’t limited to the technical side. The lyrics are far deeper than generally given credit for. With pop culture being fixated on love and peace, one would expect Sgt. Pepper’s Lonely Hearts Club Band to be anthem after anthem for the hippie movement. Instead, The Beatles use upbeat pop songs to tackle what the movement was up against: the fear of being mundane and the ever growing generation gap. On the Brian Wilson inspired “She’s Leaving Home”, McCartney narrates a story in which a young girl runs away from home to experience life as her overly protective, conservative parents wonder where they went wrong. On the outside, Lennon’s “Good Morning, Good Morning” sounds like a simple, energetic rock song (featuring one of the most underrated guitar solos in Beatles lore). But the hum-drum lyrics of day to day life is really about Lennon’s fear of being a domesticated, suburban dad. “A Day In The Life” takes that fear a step further and questions our trivial perception of life itself. Even if you don’t like The Beatles, there’s no denying the impact Sgt. Pepper had on both music and pop culture. The success of Sgt. Pepper’s Lonely Hearts Club Band is the result of many things. The world was ready to accept secular music as a sophisticated art form and not just a phase for teens. Each song is written, orchestrated and performed by legitimate artists at their creative peak and every second is taken with meticulous precision. It’s among some of the greatest albums ever recorded by any artists and its timeless status isn’t limited to fans of The Beatles. Most importantly, Sgt. Pepper’s Lonely Hearts Club Band is of legendary status because it’s simply a fantastic album.